This dissertation studies the interaction of prosody and anaphora. Its basic aim is to study the syntax and semantics of anaphora by using data from the proso­dy of sentences with reflexive and pronominal anaphors. In order to achieve that a theory of focus, i.e. a theory of the correlation between the prosodic properties of an utterance and the informational status of its parts, is laid out. The main innovation of the focus theory argued for is that it equates the domains of focus with cyclic nodes in the syntactic derivation. This theory is applied on a wide range of examples with reflexive and pronominal anaphors. In the case of reflexive anaphors it is shown that no analysis that treats them like elements of type e can capture their prosodic properties. Instead, the proso­dy of reflexive anaphors requires that i. the alternatives to a focused reflexive anaphor are argument structure operations rather than individuals, and that ii. reflexive anaphors are functions that take relations as arguments. Both require­ments are met if reflexive anaphors are reflexivizing functions. The second requirement is also shown to apply in the case of pronominal anaphors. Both reflexive and pronominal anaphors, then, are not arguments of verbs like other ‘full’ DPs. Crucially, however, in order to explain their prosodic properties pro­nominal anaphors do have to share a property with full DPs; like full DPs they have descriptive content that interacts with focus semantics. Other descriptive content of pronominal anaphors, however, like gender, does not interact with focus. This is shown to reveal something about the interaction of focus values with presupposition, namely that focus values are blind to presuppositional content. 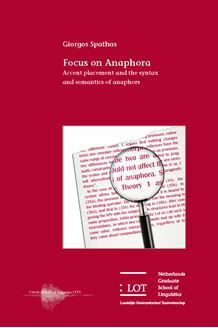 This dissertation is of interest to linguists working on binding and anaphora, prosody, information structure, and the interfaces between syntax and phonol­ogy and syntax and semantics.